African National Congress Youth League Deputy Secretary General Thandi Moraka has called on the league’s president Collen Maine to resign “urgently”. In scathing attacks on Maine at a memorial service for late stalwart Winnie Madikizela-Mandela, Moraka labelled Maine a sell-out, saying he is undeserving of being Youth League president. She accused Maine of apologising to Ramaphosa to serve his own interest and not representing the league’s stance on the ANC presidency. Youth League decided to support Nkosazana Dlamini-Zuma to succeed former President Jacob Zuma at the elective conference last December. 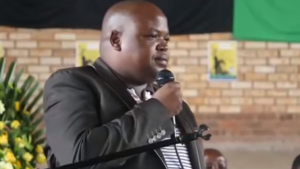 Moraka’s attacks come just days after a video surfaced of Maine telling mourners at another memorial of Madikizela-Mandela that he was introduced to the Guptas by North West Premier Supra Mahumapelo. The post Calls for ANCYL’s Collen Maine to step down appeared first on SABC News – Breaking news, special reports, world, business, sport coverage of all South African current events. Africa's news leader..